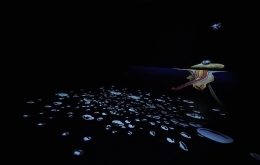 James Cohan Gallery is proud to present DANDAN, a solo exhibition by Japanese artist Tabaimo, opening September 15th and running through October 29th, 2011. This is the third solo exhibition at the gallery by the 35-year old Tabaimo, recognized as one of Japan’s leading artists and well-known for her hand-drawn animations whose coloration bring to mind traditional ukiyo-e prints. exhibitionsly, Tabaimo is representing Japan at the 54th Biennale di Venezia with the work teleco-soup, an immersive multi-media environment that transforms the Japanese Pavilion into the interior of a well, where the reflected world is inverted and boundaries between water and sky, self and world, real and imagined are fluid. To view installation images: please click here. Taking on roles as both social critic and a voice of those born in the mid 1970’s, Tabaimo strives to investigate the inter-generational divide. As globalization pervades an island nation that once prided itself on isolationism, communal traditions continue to give way to contemporary desires of individualization. Tabaimo’s work offers an unblinking look at contemporary Japanese society as a mirror in which to view herself and other members of her generation caught in the crossfire of these societal shifts. Her works capture the anxiety that is a constant reality in a land whose terra firma is less than stable, while their tone remains abstract and detached. Recurring motifs, including cityscapes, interior spaces, hands, brains, hair, insects, plants and water, hover between the elegantly rendered and the disturbingly surreal. Two of the works on view at James Cohan Gallery, BLOW and danDAN, were first shown in Danmen, a solo exhibition that originated at the Yokohama Museum of Art in 2009 and traveled to the National Museum of Art, Osaka. These two works are multi-channel video and sound installations presented on elaborately built stage sets. 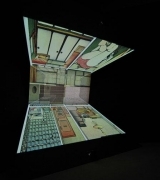 In addition, the exhibition features guignorama, a single-channel work first exhibited in the artist’s solo exhibition at the Hara Museum in 2006. This gallery exhibition marks the first time these works are shown in the United States. The central work in the main gallery, BLOW, 2009, is projected onto a curved half-pipe ramp. The viewer is invited to walk through the seamless, multi-channel projection in which human bones, organs and blood vessels surface from a watery world and morph into forms that recall the origins of life emerging from the primordial soup. 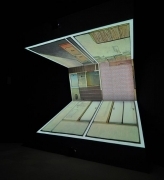 In Gallery 3, danDAN, 2009, is projected onto three angled panels that run vertically from floor to ceiling. 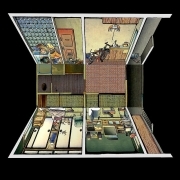 This work portrays a cross-section of a housing complex of multiple dwellings, through which the viewer peers into traditionally-styled apartments alongside those with more modernized conveniences. In these spaces, strange events happen: birds fly inside rooms, a woman spins in a washing machine, a man walks into a refrigerator, the peck of a bird’s beak causes blood to flow from a bed, and clothes turn into birds and fly away. In the front gallery, guignorama, 2006, depicts veined hands grasping, grappling and locking together in fluid motion—the pulsating blood vessels creating an emotionally fraught landscape. The artist has suffered from severe eczema and, as a result, the recurring motifs of hands and skin have come to represent the boundary between interior and exterior worlds. Tabaimo was born in Hyogo, Japan in 1975. Her work has been exhibited and collected widely around the world. Recent important solo exhibitions include: Tabaimo: teleco-soup, Japanese Pavilion, 54th Venice Biennale, 2011; Tabaimo: Boundary Layer, Parasol unit foundation for contemporary art, London, 2010; TABAIMO: Danmen, Yokahama Museum of Art, Tokyo, (traveled to the National Museum of Art, Osaka) 2009-10; Tabaimo, Moderna Museet, Stockholm, 2009; Tabaimo, Fondation Cartier pour l’art contemporain, Paris, 2006; YOROYORON: Tabaimo, Hara Museum of Contemporary Art, Tokyo, 2006. International group exhibitions include: the Yokohama Triennale, 2001; the Sao Paolo Biennale, 2002; the 15th Biennale of Sydney, Australia, 2006; and the 52nd International Venice Biennale, 2007. 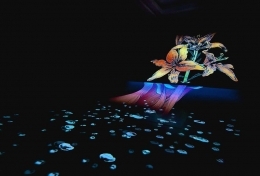 Among the museums that have collected Tabaimo’s work are the Yokahama Museum of Art, Tokyo; National Museum of Art, Osaka; Hara Museum of Contemporary Art, Tokyo; the Israel Museum, Jerusalem; MUSAC, Spain; Fondation Cartier, Paris; Moderna Museet, Stockholm; Museum of Contemporary Art, Los Angeles, CA; the Birmingham Museum of Art, Birmingham, Alabama; and the Museum of Modern Art, New York. For further information, please contact Jane Cohan by e-mail or by telephone at 212.714.9500.